Women have right to live and use rights as same as men do since both are equal and are human. Women are treated as second class citizen and made them deprived of many oppurtunities this type of behaviour is not good by a wise human being to human a part of them themselves. Human states themselves as a wise creatures but doesn't behave that way. The difference in treatment was since from the development of human civilization. Women stays at home caring childen and preparing foods for children and family while men visits outside in search of food. Then, after generation after generation it has been estableshed as a tradition and the responsibilities handed over based on gender. Women have to look after home and male go outside for either work or in search of food. While this trends goes on though the women are capable of doing any work outside they are not allowed saying that that is not their work. They have to be limited with in the walls of house. This is totally wrong. Since the time has changed a lot but the people concept are not changing that way that is creating a problems. Women are not getting that oppoutunity though they are capable. It was unjustice to women. The voice begin to raise against the injustice to women. People were under superstitious belif but with the advancement of development and knowledge all around developed countries women begin to speak about it. For the first time in US women started celebrating National Women day in 1909 and International Women Day begin to celebrate from 1911 in US and Europe developed part of world. To fight aganinst the unequality to women was more effective after second world war in the name of women's right. After the formation of UN the Internaltional Women Day first celebrated by UN was of 1977 which was the first known International Women Day. The Women's Right movement last longer (1948-1998). Since the small group with committed and thoughtful people involve in the movement to make it established in a society it takes a bit longer but bring to the subject of concern. Nowdays, it is celebrated around more than 100 countries of the world and given official holiday in many of them. Women right is the fight for the idea that women should have equal rights with men. Women were deprived of rights like right to property, right to vote, right to work for equal pays, reproductive votes, etc. Still today women are not fully secured and in many parts of world the conditionn is worst. 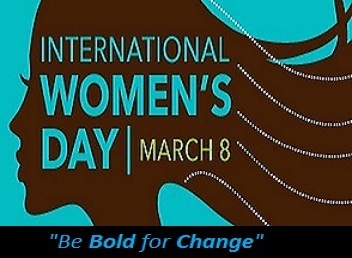 For the upliftment and to raise voice for voiceless women every year international women's day is celebrated every March 8 with different slogan everyyear. The slogan for International Women's Day 2017 is "Be Bold for Change"
So, let's get together for the right's for women. Education is the basic requirement for providing rights to them. Many girls in rural and urban as well are deprived of formal education. The no. of girls students are less as compare to men's thus unless they obtained the higher education they won't able to get equal oppurtunities as men enjoyed. In this 21st Century also women are not enjoying the equal oppurtunities as they have to. The women's are deprived of different rights in this or that way. They are not able to freely use the rights as easily as they have to. Its because they have to take responsibility of house as well. The no. of girls students are less as compare to men's. As from the News Published some days ago(I don't remember what the title was or which paper that was), No of boys is high then girls while admitted on Grade 1. But No of Girls is Much higher During SLC Examination. SLC is not the Higher Education anyway thank for your feedback. I appriciate your feedback.